Trump doesn’t seem to be the right guy. He doesn’t have the sort of character that reflects well on the United States. President-elect Donald Trump has put together a strong list of appointees to serve in his new administration. 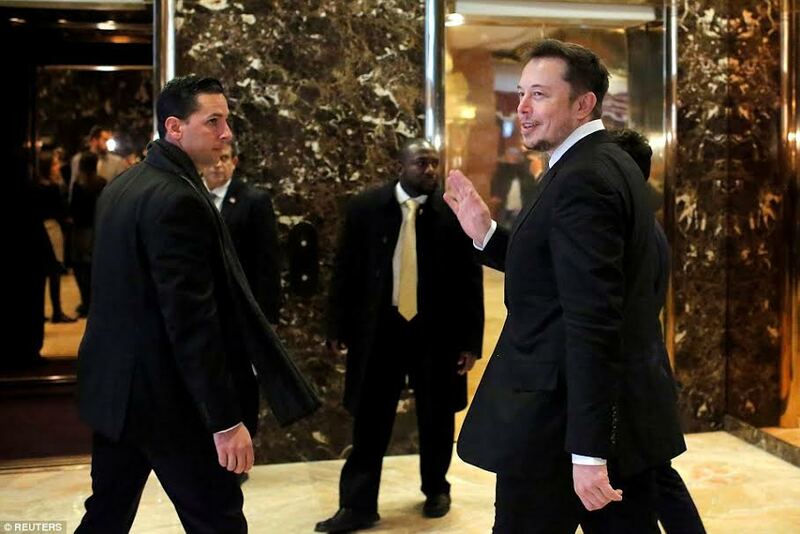 Many of his appointees have been his longest and most loyal supporters of his candidacy and his vision to “Make America Great Again,” which makes his appointment of Elon Musk to a corporate advisory panel surprising and worthy of scrutiny. When it comes to environmental and economic policies, Elon Musk admittedly leans left, or, at least, leans on the US tax payer to receive billions of dollars in subsidies for his many companies–Tesla Motors, SpaceX, and SolarCity. Citing that Hillary’s environmental and economic policies were the “right ones,” he confirmed his feelings by donating $5,000 to Hillary Clinton’s presidential campaign, yet most of his peers in Silicon valley were “Ready for Hillary.” Data compiled by Crowdpac, a nonpartisan group that tracks campaign donations, shows that employees at technology companies donated overwhelmingly to Hillary Clinton. Of the $8.1 million given by tech employees or executives, Clinton got 95 percent, or $7.7 million; Donald Trump got 4 percent, or $299,000. Like Trump and many executives, Elon has given to both parties. According to Quartz: further digging into Musk’s political giving since 2003 reveals a remarkable even-handedness, with the serial entrepreneur donating $258,350 to Democratic candidates and $261,300 to Republicans. Musk, like many executives, spreads his donations around; during the last election cycle, he gave money to both Democratic President Barack Obama and current Republican presidential candidate Senator Lindsey Graham. In total, Musk has given $519,650 to US politicians since 2003. His donations fall somewhere in the middle range of comparable executives. Like Trump and many executives, Elon has given to both parties, yet, Elon ideologically leans left when it comes to climate change and immigration reform. In 2013, Elon Musk withdrew his support, without comment, from a high-profile political group, FWD.us, founded by Facebook founder, Mark Zuckerberg. Yet, he was an initial supporter of this group who advocated and backed an immigration reform bill which would have put 10 million illegal immigrants on a path to citizenship. His political contributions were to both Lindsay Graham and Marco Rubio, who were a part of the Gang of Eight and outspoken Republican critics of President-elect Donald Trump. Tech executives, like Musk and Zuckerberg, were pushing for a comprehensive immigration bill because it would increase the number of highly-skilled foreign workers coveted by companies like Facebook and PayPal, which Musk co-founded. Musk withdrew his support within a week after the group funded ads promoting drilling in Alaska and a proposed oil pipeline between the United States and Canada. Additionally, Elon Musk stands in direct contract with President-elect Donald Trump when it comes to the science of Global Warming/Climate Change. The Tesla CEO is a prominent proponent of using innovation to do something about global warming, while Trump has said climate change is a hoax. In 2015, Musk spoke to a San Francisco audience about the importance of innovation, renewable energy sources, and especially the need for a carbon tax. Taxes on carbon emissions would help the world transition from fossil fuels to renewable energy, Musk said. There are major costs to consumption, in other words, and we can’t see the whole picture and what climate change is really costing us. The issue of climate change is neither a right or left, liberal, or conservative issue, Musk said; it’s a global issue and went on to say that “we should just end the experiment that is fossil fuels as soon as possible.” As the owner of a solar company, these words come as no surprise. But the appointment of Elon Musk is a surprise–and I am sure he was surprised by Donald Trump’s ascendancy to the office of the President of the United States. In a Trump administration, which is focused on economic prosperity, job creation, and sovereignty, Elan is going to have to shelve some of his progressive ideals that were rejected in this past election and embraced by the very people he could one day employ—without tax-payer subsidies? Time will tell.